It has just started. Now the rainy days has come. Therefore, more floods to come. Both the nature and students declared it as official. When it rains, it floods. Another something to worry: More suspended classes. Parent's anguish to their children's studies, while student's jubilation. Almost everybody's expecting flash floods, only idiots anticipate flash sharks mob. 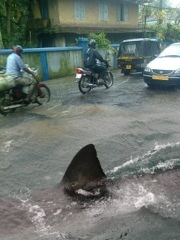 Idiot's inanity: Sharks surfacing along the floods. A very alarming situation.